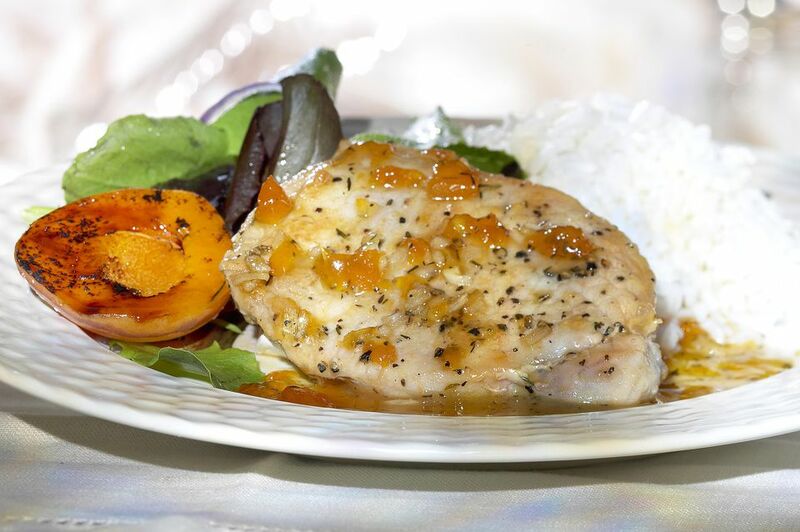 You can vary this delicious recipe for Baked Chicken with Apricots by using different fruits. Try dried pineapple with fresh, or dried cherries with fresh cherries. You can substitute canned apricots for the fresh ones easily. The combination of sweet and tender fruit, both fresh and dried, with onion, garlic, ginger, and honey mustard is just sublime. Serve over hot cooked rice or pasta to soak up the wonderful sauce. All you need for a complete meal is a green salad. Combine fresh apricots with dried apricots, onion, garlic, orange juice, preserves, honey, mustard, brown sugar, ginger, salt, and mustard in a heavy saucepan. Bring to a boil, then lower the heat and simmer for 10 minutes. Remove fruit mixture from heat and let cool for 1 hour. Heat oven to 350 F. Season chicken with salt and pepper to taste and place in a single layer, skin side down, in a 9" x 13" glass baking dish. Spread apricot mixture on top of chicken. Bake for 15 minutes, then turn chicken and spoon the fruit mixture in the pan over the chicken. Increase temperature to 425 F and bake 15 minutes longer, or until chicken is thoroughly cooked to 160 F and is nicely glazed and browned. Serve chicken with the sauce and fruit.